The Real Deal right from the stream! Years ago, before coming to Alaska, I occasionally fished egg imitations using the standard pattern... the glo-bug. It's a good pattern that still catches fish, but because flyfishers are the inquisitive type, we're always looking for something that works a little bit better than "the standard patterns." Eggs are a big deal to fish in Alaska; in fact, salmon eggs are one of the most important foods to rainbows, char, grayling and others. Over the years, I've experimented with many variations of the egg, and this most recent pattern has some credible advantages....namely, a realistic appearance. Most flyfishers know, the aquatic insects we find in rivers and lakes, present in various stages of metamorphic development (like a caterpillar to butterfly). Depending on the timing of their life cycle, metamorphic variations dictate that anglers use imitations of the nymph, pupae, and larval or adult forms to mimic what fish are eating at the time. And, although eggs don't go through a true metamorphosis, their appearance changes enough over time, that one pattern won't always mirror the natural. 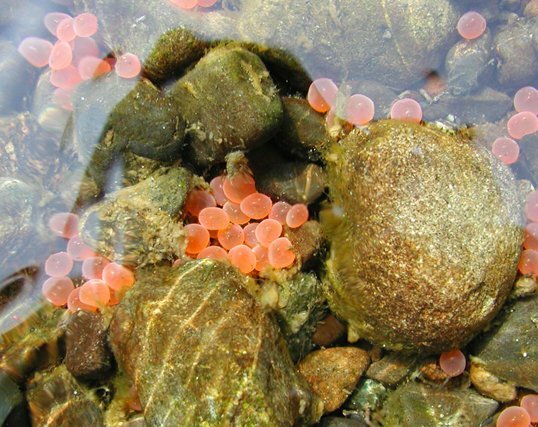 When salmon first drop eggs into the gravel redds, they are translucent, bright orange; the color we often see with egg imitations. And although fish do feed on this fresh, orange version, most of the eggs, available to fish, will have a much different appearance. The way it works, is that many of the freshly deposited and fertilized eggs are buried in gravel, not available to feeding fish, although a good number are swept out by the current. The unfertilized or "dead eggs" become the most plentiful as fish food, but they quickly lose the bright orange color. Dead eggs are milky or an orange tinged, cream color, with swirls or dots of darker orange. Creative flyfishers mimic this appearance by brushing pearlescent fingernail polish over an orange bead. And while this method works well, it's not always possible to get the right color combinations or even find the beads in the right size. Color is an important part of any imitation, but depending on the ambient light, water clarity, or speed, the profile or general size of a fly is often more important than color. 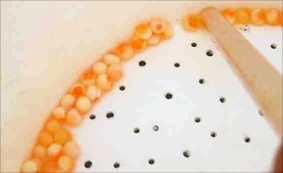 Most of the commonly found beads are either 6mm or 8mm, but not all salmon eggs fall in one of those two categories. Sockeye eggs, for instance, are mostly 7mm. A friend, and local guide Shane Schwark, introduced me to the clay egg a few years ago on a steelhead trip. I used the interesting pattern the next day and landed a few fish, but it wasn't until later that fall that I better realized its value. Rainbows were keying on eggs, taking them with abandon, and almost any egg pattern was working. Catching fish wasn't a problem, and I saw it as an ideal time to make comparisons between patterns. I began fishing a dual fly rig using a dropper setup, working many of my favorite patterns simultaneously with the new egg. There was no comparison....the earthen egg clearly out-fished my regular patterns, and although it was encouraging, I took it with a grain of salt. At the time, I thought the timing must be just right for that fly on that day. Well, the timing must have been right for the rest of the season, as it consistently outproduced other popular patterns, and I liked the way it fished. A clay egg has just the right density and weight to get down quickly, but it's not so heavy that it's constantly hanging on the bottom. It just fishes well, which I think is part of its effectiveness. On the downside, the earthen egg is not as durable as a plastic bead. It will occasionally crack if you whack it on a rock, but when you'll most often break it is while seating the toothpick. On the upside, you can easily choose the exact size and color variation when forming the eggs at home, and with a small investment in clay, the average flyfisher will have more than enough eggs for an entire season.